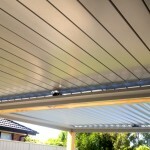 What’s the best Louver Roof Verandah? 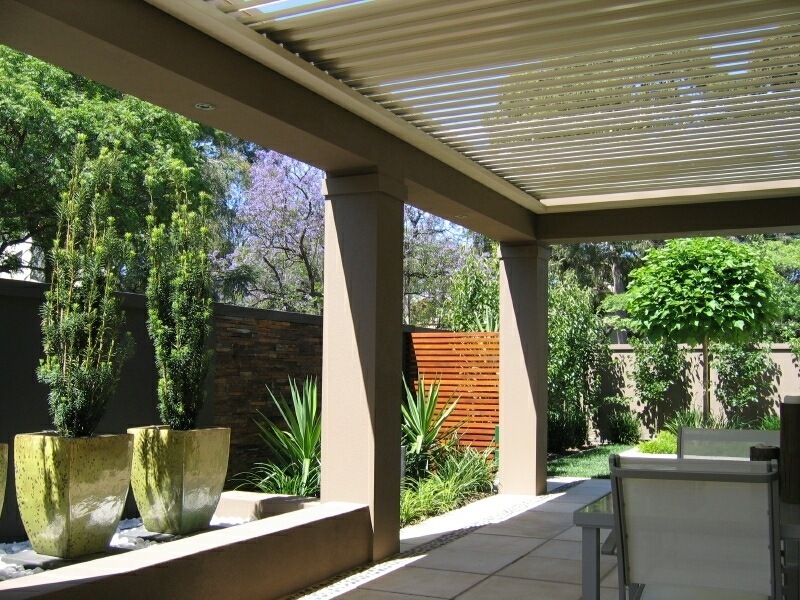 What’s the best Louvre Roof Verandah? 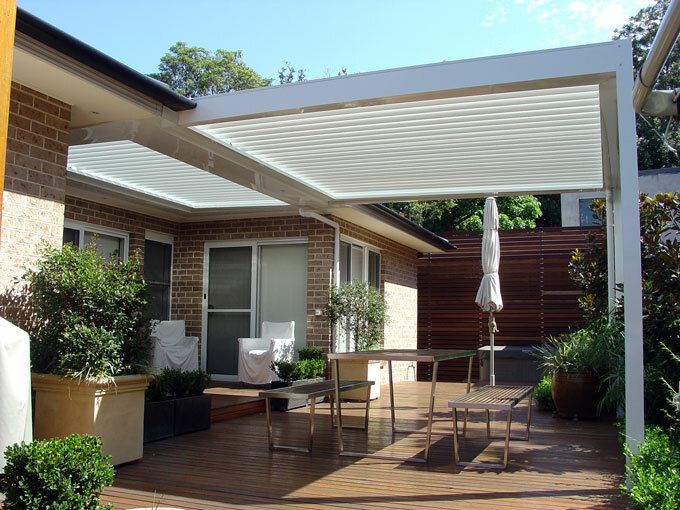 What’s the best Louvre Roof Verandah question is difficult to answer without each manufacturer passionately suggesting theirs is the best louver roof system. The real answer is probably related more to your overall expectations of durability, weather resistant factors, visual project design’s outcome and finally price. I will review some items that to me on balance should be considered. Durability – this will relate to both blade and to the opening roof system – motor and general mechanism. Heavily debatable but my experience on blade systems is that aluminum blades do provide best durable outcomes certainly around seaside applications where rust could become an issue. Aluminum although often more expensive to colorbond blade options should provide greater durability, span options and performance if installed correctly. 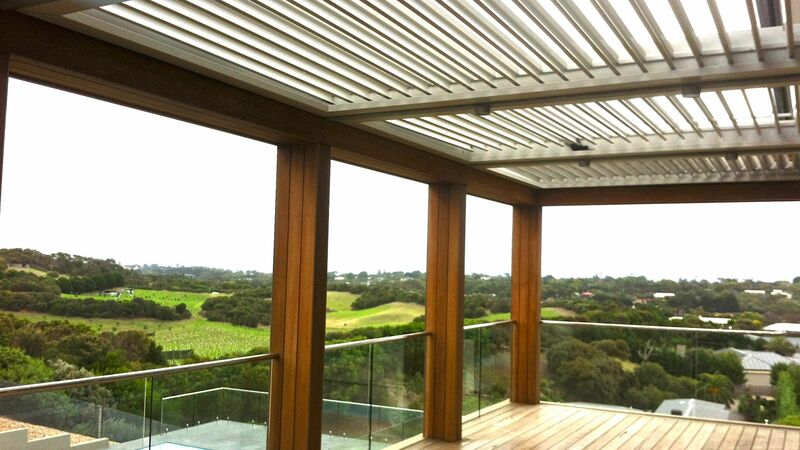 Louvre Blades – Two louver types seem to occupy the opening and closing louver roof market – Colorbond or Aluminum. Check that warranties include a minimum 10-year warranty and that local maintenance options are available. Clearly nobody wants a problem but worse if no local dealer available to attend to any problem arising. Some have stainless steel and aluminum pins and connections which should also ensure greater durability. Colorbond – generally a two piece pressed blade with foam within the core. Less robust than aluminum options and subject to rust. Colour options are also restricted but main options normally available. Often at the cheaper end of the market. Aluminum – Generally a solid robust louver with powder coated or anodized finishes. Colour options are not restricted with stunning wood grain options available. 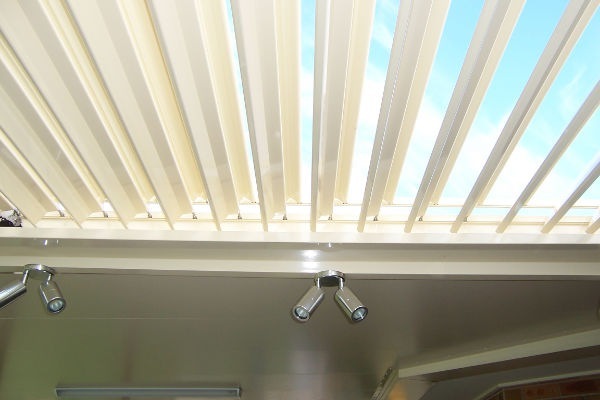 Louvre Opening Systems – As louver roof systems have now been around for over 20 years you will find most manufacturers have systems that will do the job of opening and closing your roof. Certainly some systems can be much more complicated and therefore expensive to purchase, install and maintain. Check your warranty options to ensure minimum 3 years for electrical and what components might be subject to ongoing maintenance. “A main difference may be speed of opening, amount they will open and noise related to movement of louver. A main issue might be the “opening capacity 90, 135 & 175 degree” as how much you can open your roof from closed can provide more light and shade options to the user”. Weather Resistant – Although I have seen some reviews suggesting otherwise my own research and experience tells me most manufacturers can now provide great product performance when its raining. “Certainly cloud burst or torrential rain might provide some abnormal issue’s, as with any roof, under most conditions the louver roof will perform for many years if installed correctly”. Project Outcome – this relates not only to the actual “louver look” but also to the actual frame outcome. Having your project match or compliment your dwelling will ensure more compatibility and a better visual outcome. Pricing (cost) clearly comes into the equation however ensuring a compatible outcome will provide strong payback in terms of visual outcome and long-term durability. Frankly a closed louver will provide similar looks between one and another underneath by around the area is just as an important factor. The difference will be in the eye of the beholder but my suggestion is make a whole project decision not a one component decision. Therefore, ensure a reasonable weighting to frame construction and its looks should be 50% of your decision outcome. Proven Service – having the capacity to have your opening and closing system serviced is a smart decision. Motors will grow old, component’s will ware and other factors arise that require rectification. Ensuring you pick long-term locally based distributors with some maintenance options will provide further peace of mind to your purchase. Pricing – There can be many factors that make prices vary. Certainly I feel if you balance your needs with the needs of ongoing performance will ensure you consider the pricing option right for you. A couple of price and design price options should be considered to establish the price level of your verandah for you to consider. Summary – What’s the best Louvre Roof Verandah, well not an easy answer but certainly there are a range of factors you now know what you might consider when deciding on your builder. 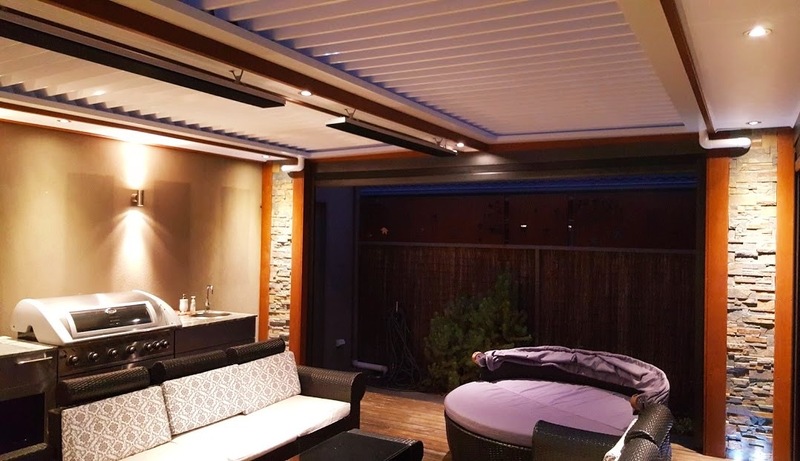 Picking an established builder with direct experience in louver roofs who can provide you the design outcome, benefits, permits and price that’s right for you is probably the smartest decision of all. 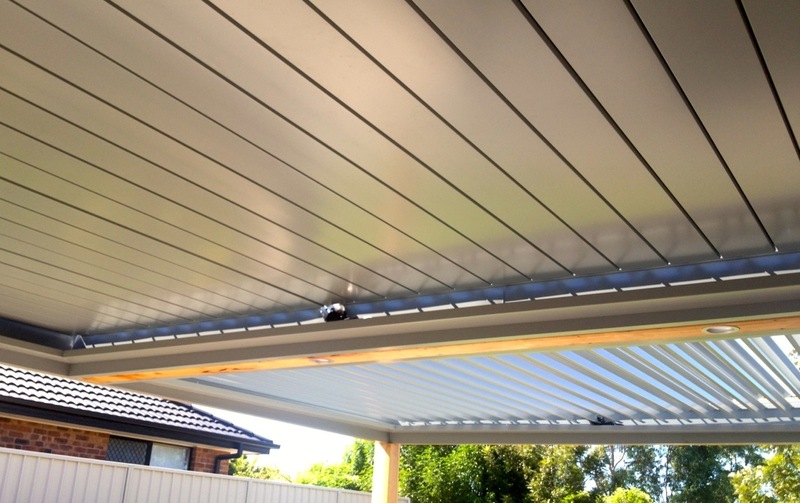 Our Services – We at the Project Centre @ Beaconsfield or Hallam branches can provide you our significant experience in preparing the building plans and arranging all permits for your Louver Verandah project. Once you have decided who’s product you wish to use or just want some advice contact us to get your project underway. Posted in General	| Tagged light and shade, louver blades, louver opening closing roofs, renovation ideas, vergola, What’s the best Louvre Roof Verandah? Louver Opening and Closing Roofs. 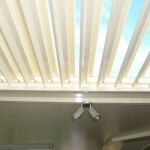 Recently we have been designing a range of projects featuring Louver Opening Closing Roofs. Not always are we required to nominate a final manufacture we have reviewed a number of manufacturers within Melbourne Metro area. Our review included types of Louver blades available, benefits and design styles and limitations both related to louver and their related systems that we could recognise to advise our clients their possible design options. There are certainly some variation between suppliers that are worth considering beyond the general final cost of the project. In other words their not all the same. Material types of Blades – Colorbond or Aluminum appear to be the two selections available. We have been asked about clear (see through) but I have not seen an option to date. Spans – Maximum Spans range from approx 3.6 meters to maximum 3.9 +/-. suppliers dependant Bottom line – wider blades seem to provide longer spans. Longer spans seem to encourage more blade defection (sagging). This factor to be considered in blade performance. We have found the need for extreme spans can be overcome with good design. Our preference is to ensure spans are within blades capacity. Durability – Steel base (with Colorbond or coloured finish against Aluminium (raw or powder coated). Certainly Aluminium blades seem to be popularly favoured. Vergola, Straco for example and a range of other manufacturers still maintain Colorbond blades. The durability is not known but can only assume if installed per manufactures requirements then warranty indications will be achieved. Aluminium seems not to have rust and defection issues that colorbond web conversations suggests. Certainly not the only issue under review but certainly if your near the sea or if warranty of product limited this might be a factor to be considered. Shape of Blade – shape of blades certainly can vary between manufacturer’s. This seems to a large degree a personal choice issue, although some of the wider blades clearly relate for span issues. No blade I reviewed was what I would call horrible. Frankly, if blade considered can tick off all the building issues then its down to which one appeals and cost. Colour of Blades – Colorbond blades do seem to have a narrow range of colours available. This can vary between manufacturers – check what your manufacturer can offer as certainly it is generally restricted. Aluminium blades have not colour restrictions as they seem to be powder coated to order. This can help is matching a colour on existing building such as door or window colour. Having raised this issue, I personally favour lighter blade colours due to benefits of light bounce provided by lighter colours. Dark colours tend to close down the feel of the area. Mechanism of Opening and Closing – the motors, sensors, connections (blades to turning components) are certainly a factor to be considered. The warranty’s all seem to be minimal so the cost to replace a motor in 5 years for example should be considered. Currently, we have only heard of minimal issues related to this factor with no manufacturer being a standout “good or bad” to our knowledge. My own feeling is if the system simple and easily maintained, then less possibilities for things to go wrong or to be costly to repair. Check the opening capacity of blades up to 90 , 120 or 180 degree. Some blades can open a full 180 degree and this I consider a benefit to controlling light. Warranty – Certainly there does seem to be some variation between manufacturers with the best warranty I have reviewed for blades and pins being Totally Outdoors supplying Eclipse Opening and Closing Louver Blades. Frames – Our main position on fames essentially comes down to visual outcome. Personally if considering the most expensive roof option (which louvers seem to be if fixed glass not considered) then to “knock up a cheap timber frame” may not offer the best outcome. The general options seem to be Colorbond and Aluminium in the sleek modern feel (I have viewed some some bulkheads in merbau – see top picture), bulkheads using conventional blue board rendered (adjacent picture) or some new hardboard options painted. No right or wrong on what selection you decide on except ensure it blends and adds to the visual outcome of the area you have envisaged. We have designed a range of all of the above. Note: Note all suppliers offer a full range of frame options. How can we assist – The Project Centre can provide drafting related to any manufacturer you may chose. There will be manufacturers engineering and specifications be required to ensure design / product requirements are in sync. Contact us to discuss your project. Links of Interest for Louver Opening Closing Roofs are provided below to assist your review of options, warranties and styles. 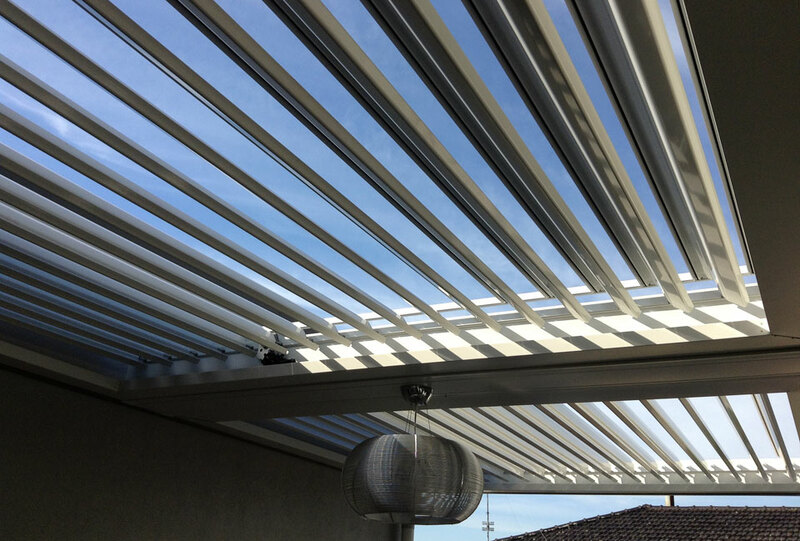 The Louver Opening Closing Roof is an exceptional roof option if your outdoor area would benefit with the option of controlling the amount of light / shade / heat to both the outdoor area and possibly to the actual dwelling (i.e. : internal room) or public area (restaurant -internal section). We hope we have provided a reasonable overview of main and important issues you might consider beyond just the final price of your project. Final cost does relate, as we know, very much to performance, durability and usability of the project. We would have loved to provide a tick off comparison but as products specifications and site situation vary it makes it somewhat difficult to review in that format. We suggest review of web sites and general web forums may also assist you with choosing the right blade and builder for your project or why not contact us to design and provide advice to consider.